Open to the Public. Catering to Your Favorite Restaurant. Get a Great Price Quote Today! 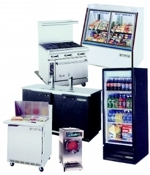 Commercial Cooking and Refrigeration Equipment and Supplies. Call Today. Ducote's Restaurant & Bar Equipment is a family-owned business that has been a restaurant equipment supplier since 1971. We are open to the public, but specialize in commercial cooking equipment, refrigeration, and supplies for the food service industry. Our 35,000 square foot showroom features everything you need to start or grow your bar, restaurant, hotel restaurant, or catering business. Because we buy such a large quantity of items, we get the best price for equipment and pass the savings on to our customers. Our inventory includes many top brands such as Southbend, Norlake, Blodgett, Hoshizaki, and many others at affordable prices. Give us a call today at (225) 384-6648 for more information on our vast selection of restaurant and bar equipment. A sales manager will be more than happy to provide answer any questions you may have and help you place your order. Top Restaurant Equipment Brands at Low, Low Prices!!! Why Buy From Ducote's Restaurant & Bar Equipment? Call (225) 384-6648 to Speak With a Sales Manager Today! Copyright © 2018 ducotesrestaurantsupply.net All rights reserved.